In our College of Medical, Veterinary & Life Sciences we have a brilliant and diverse group of veterinary researchers who split their time between dealing with disease and duelling with data. Among them is Ian Ramsey, Professor of Small Animal Medicine at the School of Veterinary Medicine and Associate Academic of the Institute. Primarily a vet, Ian’s research has made him one of the UK’s leading authorities on canine Cushing’s disease, a distressing condition caused by the overproduction of the hormone cortisol. With over 10,000 dogs in the UK affected by Cushing’s it is a critical issue for our four-legged friends. Tune in to this episode of Naturally Speaking Shorts, and hear all about Ian’s work as a vet and his fight against Cushing’s disease. Small terriers like this are particularly susceptible to canine Cushing’s disease. MattysFlicks [CC BY 2.0], via Flickr. 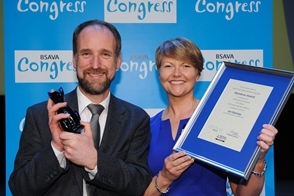 UPDATE July 2015: We recently heard that Prof Ramsey has been recognised by the BSAVA with the Woodrow Award for outstanding contributions in the field of small animal veterinary medicine. Well done. Check out some of the great research being carried out by vets at The University of Glasgow’s School of Veterinary Medicine!